Figure 1: 3D representation of the AFM nanometric tip used to obtain the direct piezoelectric characteristic of a thin film ferroelectric material. 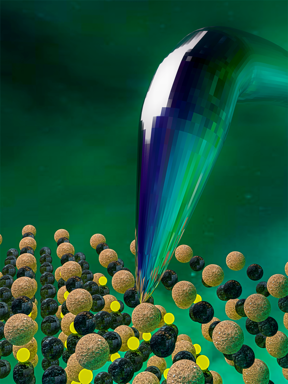 The BFO ferroelectric material, with perovskite crystal structure, was used to demonstrate that the direct effect takes a role at the nanoscale level. A team of researchers have demonstrated the viability of the direct piezoelectric effect in a thin film Bismuth Ferrite Material for the first time. The work, published in Nanoscale entitles “Direct and Converse Piezoelectric Responses at the Nanoscale from Epitaxial BiFeO3 Thin Films Grown by Polymer Assisted Deposition” which has gained the cover letter of such journal. The good quality of the films arising from a novel method based in polymer assisted deposition ensured a constant and reliable current signal. Nevertheless the reliability, the signal to measure is, because of the generated charge, extremely weak. Specifically, researcher measured currents in the femtoAmpere level (10E-15 Amperes). Consider that a typical personal computer consumes around 1 A. The current signal was integrated to find the d33 characteristics of the material. This research is crucial for the development of piezoelectric material and it is understanding at the nanoscale, being the very first time that the direct piezoelectric effect also works at the nanoscale.